IBIA Africa’s seminar, “New Rules, New Fuels, New Era” held on 16 August in Cape Town was hosted by the law firm Webber Wentzel and attended by 85 delegates. The seminar covered the impact of the IMO’s upcoming global sulphur cap and addressed many of the questions raised by industry. Our speakers, Justin Murphy (IBIA CEO) and Neville Joseph (Regional Operations Manager, Intertek) took the attendees through aspects of what this legislation means: new rules – looking at how the sulphur limit will be enforced, and whether there is any leeway; new fuels – looking at what the options are for compliance, with more choices than ever before for ship operators to consider; and finally the new era – looking at what the future of shipping looks like as emission regulations become ever tighter. 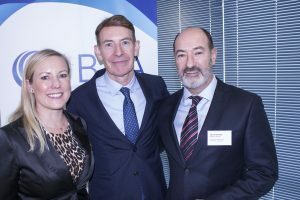 IBIA’s CEO Justin Murphy flanked by Tahra Sergeant, Regional Manager for IBIA Africa, and Patrick Holloway, partner in the law firm Webber Wentzel and IBIA board member.